Mari Magdalene is a medicine woman standing strong in her Devotion to the service of the Goddess. The dictionary recognizes medicine as a synonym for magic, here I apply it to magical forms of healing. She is not only a healer, although healing is one of her duties. In her Devotion she possesses powers as prophet, seer, priestess, and above all a holy woman who can speak with the unseen and know the ways of the Great Spirit. She communes with beings dwelling on all levels of creation and her love is devoted to all. Magdalene holds the Vesica Piscis contained in the symbol on the lid that covers the opening to the Well in the garden. In my painting the icon is a sacred medicine shield held over her womb, laced with sacred essences toned in Holy water. The Vesica Piscis is a sacred geometrical pattern that represents divine union. Its two identical, interlocking circles signify two polarities, the magnetic and electric, coming together to form a trinity. This sacred geometry shows us that we need both the feminine and masculine in equal proportions for peace in creation to occur and to keep all of life in balance. Quit the Night and seek the Day. 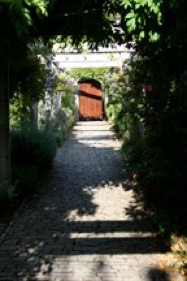 In the fall of 2005, I move to the Isle of Avalon Glastonbury, England. It was here I found a special kind of peace and sense of home, touching ground, drinking in the green magic like a thirsty faerie, awake and living a dream come true. My second day in Glastonbury, I was commissioned to paint Mari Magdalene at the Chalice Well. I could not have imagined a more gracious welcoming by the Goddess. Mari Magdalene's story is intimately linked with Jesus. Myth speak of them being together at the Chalice Well, in Glastonbury. 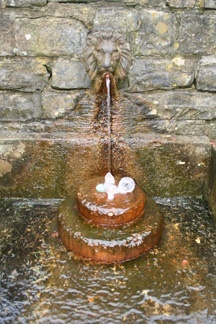 The Chalice Well has a white spring and a red spring originating from ancient aquifers. King Author and his knights drank from the well for blessings before going into battle and Jesus and Mari Magdalene received blessing from this sacred water. With magical healing qualities the Chalice Well water holds the life-giving blood of the Earth Mother. Before I begin a painting I cleanse and bless the blank canvas. While I spent timemediating at the Chalice Well and blessing my canvas, an introduction set the stage for another blessing. I was asked if the painting I did of the Archangel Michael could hang in the room that over-looks the garden and at Well. Blessings of the Goddess are grand. To this day Archangel Michael is on His lay-line holding a space of protection she said, “The Well so desperately needed.” I am grateful. Mari Magdalene’s essence came through stronger than any presence I had called forth at that time. From the start, even before I laid any paint on the canvas, her spirit was visible to me glowing already in the Holy waters I used from the Chalice Well. Yeshua/Jesus, thee beloved Christ on her masculine side was consistently present in the most extraordinary way. When Jesus was crucified, Mari Magdalene was there in her Devotion. It is she who discovered the empty tomb, and she who testified to His resurrection. True love is devotion, love is the only true authentic power. Love is all there is. Mari Magdalene's story of Devotion is intimately linked with Jesus. The two are immaculate expressions of divine spirit in human form. Together they join into the world the Divine Feminine and Masculine completing the energy line essential for sacred union. Sprigs and bark, sacred medicines from the Yew trees at the well and two of the last rose pedals before the frost, collected on one of my visits, all bless the essence on the canvas along with the holy waters, frankincense and myrrh. White owl offers blessings in wisdom of the highest order. White dolphin is an icon of the innocent play bringing in the Christ consciousness. The peacock is her wisdom headdress crown and cloak, a symbol of death and resurrection and vision. The peacock, in particular, when shown with Christ, is particularly representative of the last supper and the incorruptibility of Christ's body and, by extension, the human soul. Below two white doves ignite the sacred symbol of infinity… infinite love and peace in Devotion to each other. The Egyptian symbol of the Anuk and other eclectic images suggest studies in the ancients. I sense the symbolic representation of us, as the human race, coming full circle and experiencing transformation for all that has been. As I approached upon the completion of painting the Magdalene nearing the Winter Solstice, another auspicious commission hired me to paint Yeshua, the Tanzanite Christ. In keeping with the spirit of their love, and recognizing the perfection in another gift of honor, there are no coincidences; I painted them side-by-side. Mari is the divine feminine and Jesus the divine masculine. The lack of acknowledgment of the feminine divinity in Mari Magdalene is an archetype for what is created as a state of imbalance that reflects the harsh destruction that is occurring on our planet Mother Earth. Mari Magdalene was a holy woman who recognized this truth and honored the Mother in what we call the old religion. In the beginning when light and sound came into the world, the Goddess as the Great Mother was recognized as the fertile womb, which gave birth to everything. The Great Mother carries within her being the dimensions and inter-dimensions of sky, earth fire, water and spirit. She is the great pulse of life reflected in the rhythm of the moon, the sun, the stars, the plants, trees, animals and human beings. All these are Her children and She the mystical presence within all life, continually regenerating in a cyclical process that is infinite without beginning and without end. In relationships feelings of inequality, conditioning and DNA coding have set up boundaries and illusional beliefs, between man and woman. In order for sacred union to occur individually and globally, the illusion of separation has to be healed. Within our selves first, we must dissolve duality and clear our energy channels of judgments that create disconnection from the feminine principles from the body and emotions. We must reclaim the sacredness of sexual and spiritual union and embrace a relationship of co-creation. Our heart is the chalice that holds the Holy Spirit; it is here in devotion we bring the Self into rapture with the Divine. Our devotion, respect and belief of self is our connection to embody Spirit. There is only one God yet still infinite perceptions and choices. No matter what insanity is going on around us, we must be devoted to our internal Divine Union. God speaks; we must take the time to listen to what the Infinite has to say, devote ourselves to a practice. Prayer is the act of talking to God and meditation is the act of listening. Both practices seek communion and require Devotion. The importance of prayer reverence, respect love, honor of each other and the God/Goddess in nature in all of Creation, Devotion to this union with Source is unprecedented. Traveling through the ancient myth and lore of England, awake in an ancient dream, I gazed in awe upon Stonehenge, I danced with the mysterious stones in Avebury and chanted in her groves and ancient forests, meditated in Druid burial grounds and caves, the mounds of mystery and life. I found Merlin. I shared the fur of the White Buffalo in offerings and I greeted many elders in the ancient Stones sensing a deeper understanding with the ancestors. I ran all the way up to the Tor, every step a blessing for the Goddess. After gazing in the Chalice Well, I could close my eyes and see it in my other eye. Dancing; chanting and playing like a faerie child, free and wild. Rejuvenating a once lost part of myself, creating art… and bridging the rainbow’s arc I landed home on the Holy Isle of Avalon, drinking in the nectar so rich in heart and Her-story. This is the age to move from ignorance to enlightenment. It is time that each of us uses the hearts we have to expand our mind with knowledge. Humanity has been silent and ignorant long enough. Inundated with lies, millions of women and men killed during the Inquisition, horrific molestation of the innocent, assault of spiritual law and truth. The Mari Magdalene that lives in our minds due to conditioning is quite different from what is truth. Her major association with Jesus is as the woman washing and anointing his feet, but she is most known as a prostitute. Mari Magdalene is mentioned in each of the four gospels in the New Testament, but not once does it mention that she was a prostitute or a sinner. Somewhere Mary Magdalene became confused with two other women in the Bible: Mary, the sister of Martha and the unnamed sinner from Luke's gospel (7:36-50) both of whom wash Jesus' feet with their hair. Pope Gregory perpetrated the lie by about 500 years after the disappearance of Jesus. This lie was continued by the Church until, give or take a hundred years or so. The Catholic Church did later declare that Mari Magdalene was not the penitent sinner, but this was not until 1969. Although the false reputation still lingers, the truth pushes towards the sun like a new green shoot breaking through the asphalt of deception. Jews at the time of Jesus, history clearly pointed out that in order to be called a rabbi, he had to be married. There is no evidence of Peter ever going to Rome or that the title of bishop was used before 325 A.D. The only 'proof' or 'evidence' of Jesus comes from the New Testament which was created in 325 A.D. by Emperor Constantine who had sought the advice of a female oracle's writings of 500 years before. The oracle prophesized that the one head of the Roman Empire at this time would have to create a new religion in order to stay in power and Constantine did by converting to Christianity. Much of the faith itself depends upon her witness, and as such… Mari Magdalene historical significance cannot be ignored. To purchase an original print, please contact me by filling out the form below.